Pest description and crop damage The adult pea weevil is a chunky beetle about 0.19 inch long with a short, broad snout. It is brown flecked with white, black, and gray patches. The top of the abdomen is exposed behind the wing covers. The larva is C-shaped, up to 0.25 inch long, legless, brown-headed, and cream-color. Adults feed on pea pollen, and the female lays eggs on developing pea pods. 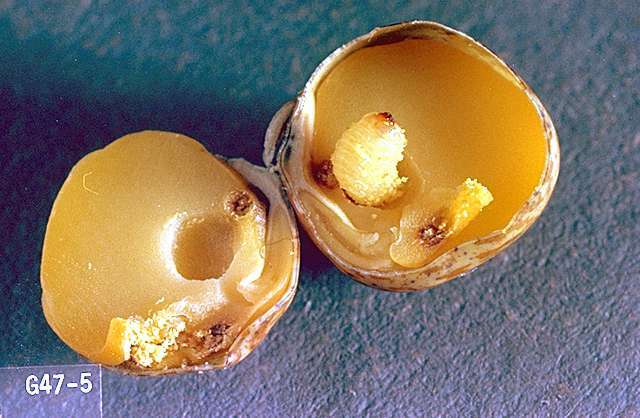 The larva burrows directly through the pod, where it feeds and develops in the developing pea seed. While one larva develops in a single seed, nearly every pea may be infested when populations are high. Biology and life history Adults overwinter with peas primarily in storage but also in the field. The pea weevil emerges about when peas are blooming, feeding on flowers (pollen and petal), leaves, or pods. 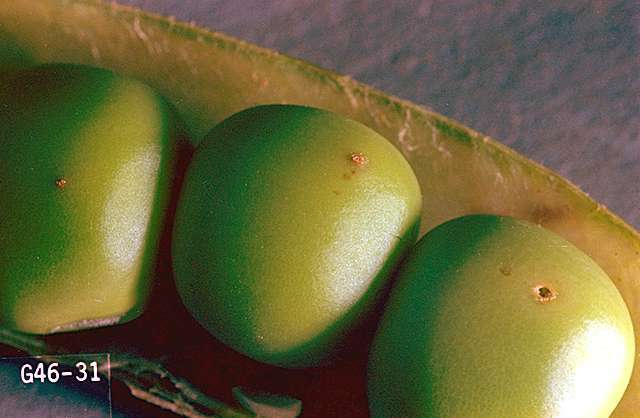 The elongated yellow eggs are laid on the outside of the pod singly or in pairs. Although one to a dozen eggs are laid per pod, only one larva develops per pea. Hatching is in 1 to 3 weeks. The larva burrows through into the pea and matures in 5 to 6 weeks. Infested peas "heat," aiding larval development. Pupation takes about 2 weeks, late in summer. Adults may leave the pea immediately or stay inside it all winter. There is only one generation per year. Pest monitoring One weevil in 25 sweeps may result in 10% infested peas at harvest. Take samples along field margins, fence rows, and in the field. The most conservative approach is to apply appropriate insecticides at bloom prior to detecting adult pea weevils. It is very important to destroy crop residues. Do not plant infested seed unless it is fumigated. 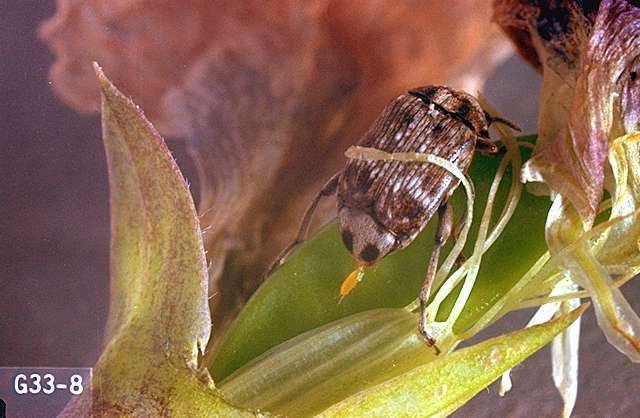 Careful harvesting prevents shattering that can disperse weevils throughout fields. Destroy volunteer plants. Early planting and harvesting is also desirable. bifenthrin-Do not use on dry peas. Insecticides must be applied soon after first blooms appear and before pods start to form. 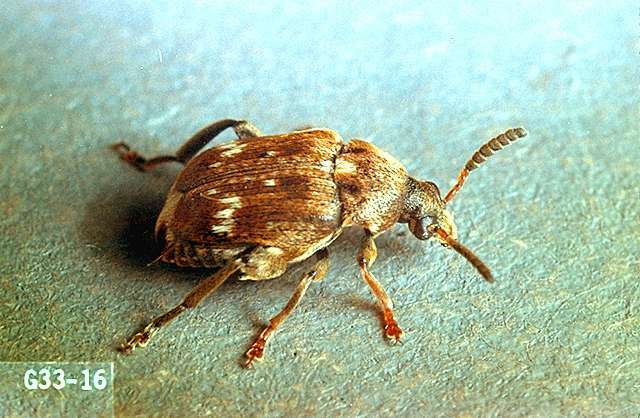 Additional applications may be needed to control migrating weevils. bifenthrin (Capture, Sniper) at 0.033 to 0.1 lb ai/a. PHI 3 days. REI 12 hr. Succulents only. Do not exceed 0.2 lb ai/a per season. Do not apply within 25 ft of an aquatic habitat, 150 ft if applied by air. carbaryl (Sevin) at 1.5 lb ai/a. PHI 3 days for succulents, 21 days for dried, 14 days for forage, 21 days for hay. REI 12 hr. Do not exceed 6 lb ai/a per season. Toxic in aquatic habitats. Latex-based formulations such as Sevin XLR Plus are less hazardous to bees. esfenvalerate (Asana) at 0.025 to 0.05 lb ai/a. PHI 3 days for green peas, 21 days for dry peas. REI 12 hr. Do not exceed 0.2 lb ai/a (dry peas) or 0.1 lb ai/a (green peas) per season. Do not feed or graze treated vines. Do not apply within 25 ft of an aquatic habitat, 150 ft if applied by air. malathion (numerous products) at 0.94 to 2.5 lb ai/a. PHI 3 days. Do not graze or feed to livestock. REI 12 hr. phosmet (Imidan) at 0.7 to 0.93 lb ai/a. PHI 7 days for green peas or grazing, 10 days for cut hay. REI 24 hr. Warning: Imidan residues can be highly hazardous to bees for up to 4 days. Do not use this material if blooming weeds are near field borders or adjacent areas.